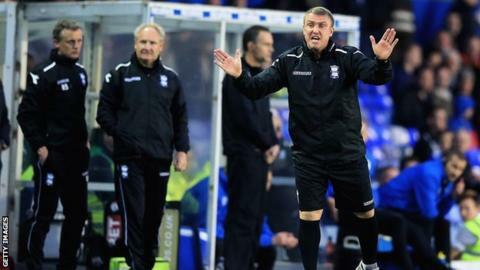 Relegation-threatened Birmingham City manager Lee Clark says that staying in the Championship on Saturday would reward the faith of their loyal fans. Although attendances have continued to drop at St Andrew's this season for a third successive year, the club's uncertain off-field future is a factor. Blues will be backed by a sell-out 3,800 away crowd at Bolton on Saturday. "We've got to keep fighting for these unbelievable fans. They never cease to amaze me," Clark told BBC WM 95.6. "The support they have shown us, considering what has happened, is fantastic. "Everybody will be giving everything on Saturday to try and stay in this league." Tuesday's home defeat by Wigan Athletic, Birmingham's 18th straight failure to win a home Championship game this season, leaves them a point shy of safety. After five straight defeats, Blues' worst run of results since Clark took charge 22 months ago, they now have to get at least a point at Bolton on Saturday to stand any chance of staying up. They could still go down, even if they win at the Reebok Stadium, depending on results elsewhere involving Doncaster Rovers, who are at champions Leicester, Millwall who host Bournemouth and Blackpool, who take on newly safe Charlton Athletic. Nobody's feeling sorry for us. We've just got to dust ourselves down and go again. But, although Blues have the worst home record in the country, having picked up just 14 out of a possible 69 points at St Andrew's, they have one of the best away records in the division, having won nine times on the road. And the 3,800 away following that they will have at the Reebok is more than three times this season's average travelling support (1,179). They are also up against a mid-table Bolton side with nothing to play for. And Clark insists that, fuelled by the backing they got from the home crowd on Tuesday in front of a 20,427 crowd, well up on the season's average of 15,457, his side remain focused. "It's a very disappointing evening," added Clark. "Our destiny isn't in our own hands any more. "It doesn't help when, with a minute and 30 seconds gone, you're a goal down. But nobody could have faulted the effort. They're a proud bunch of lads. And we've not lost that belief. "Nobody's feeling sorry for us outside the club. We've just got to dust ourselves down and go again." Meanwhile, Blues have handed new one-year contracts to two of their youngsters, keeper Nick Townsend and midfielder Charlee Adams. Defenders James Fry, who suffered an injury-hit campaign, and Amari'i Bell, who finished the season on loan with Kidderminster Harriers, have both been offered new terms. But strikers Akwasi Asante and Reece Hales plus right-back Ryan Higgins will all be released once their current deals expire at the end of the season.